Here is an ecolonomic idea. You can make some money while cleaning up this world. Recycling has many benefits that go beyond money! Here are 5 ways you can turn your trash into cash. It’s amazing how much garbage we create every day. There is trash in your kitchen, in your bedroom and also bathroom, stuff like wrapping and packaging paper, aluminum cans, peels from fruits and vegetables, and so on that can all be reused and can be worth a lot of money. In this article we will show you a few really easy ways that you can use trash to make you some solid cash! When we talk about ecolonomics, it’s exactly that. You can make money by making the planet better as opposed to polluting it as many economic practices do. Recycling and reusing old stuff saves a lot of landfill space, along with a lot of energy and fossils that are associated with them. Even wasted food can be reused and turned into organic fertilizer. It is important to be mindful of the things we choose to throw away even ones we think should be waste.There are also money and energy wasted when you waste food. Think about all the energy and resources wasted in farming when growing food. Energy is also wasted in irrigation, transportation and storing of food. So as you can see there are many areas in which humans can become more efficient in our economic activities to make less waste, and as a result a healthier planet. Make Money Making the Planet Better! Here is how you can recycle and reuse trash and make some cash while doing it. Although you won’t get rich quick in this business, you will still be your own boss, and you’ll be doing something good for the planet. So here are some ways to make money by helping yourself and the Earth. This is not going to be a get rich quick business. This can be your hobby, a part time job, or you can even take these ideas and turn them into your full time profitable green business! What better way to make money than this! You can actually make money recycling scrap metal. Some old household trash like aluminum cans, tin cans, old metal wire, metal furniture etc. sells for good money. You’ll often come across valuable metals like copper, silver or gold. This saves the environment by reducing the pressure on metal mining. Almost all metal things can be recycled for cash so keep your eyes open for any potential metals that can be recycled. If you have just bought new electronics and don’t need your old stuff, you can sell them on a yard sale, or even sell them on the internet. There are many websites that do such trades. Many companies will by old cell phones, computers, laptops ,and almost anything. This is a common one for a lot of people so make sure you take advantage of this, now that we live in a world where there are always new electronic devices on a regular basis. You can sell almost everything from your old chair, clothes, shoes to your fishing rods, old musical instruments like a guitar that you don’t play anymore. All of the stuff that is in your garage that may seem useless to you, can be useful for someone else. Set up a garage sale, or find a consignment shop around you that will gladly take your items. Here we have some business ideas that we may call ecolonomic. They are economically profitable and environmentally sound. They improve our environment and make our planet better, and you can also make good money doing it! This is a perfect win-win situation for you and the rest of us! 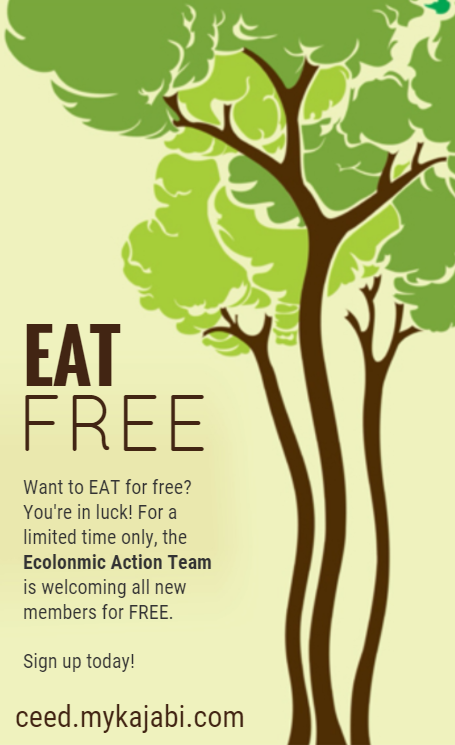 To learn more about Ecolonomics, join our Ecolonomic Action Team (EAT). We’d love to hear from you, so please add your comments in the comment box below or visit our Facebook page.